I just had to create a little knock-around thread for this subject, which some here may be familiar with from a post I put up in "Vintage and Unusual Carvins" about a few months ago. 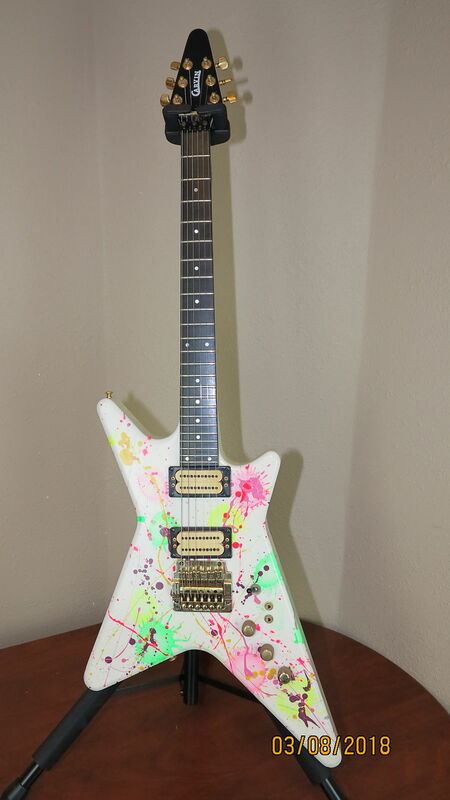 I posted about this paint-splattered 1985 Carvin V220 that a dude obviously had custom painted himself at some point... and had now put up on Reverb. Decent condition vintage V220. I'm partial to these as set necks, since that deep warm sound of the Explorer comes a good bit from the set neck construction, which gives it a nice full fat rounded SG/Les Paul slab body sort of a tone. Anyhow, the guy's price was $799. It sat for about 7 months. Then it sells on the 9th of this month. In some ways this is completely ordinary (buys equipment, tries to turn it right around for quick profit, a process as old as the hills)... but as a Carvin watcher, via the size of the markup and the guitar itself and the way it's just laid right up... gives me Lulzeronies. Re: The Bizarre V220 Gamble of Chicago Music Exch.. This thing has been in my watch list for a while, just because it makes me chuckle. Must've been some special paint option. Ya know, we have sparkle finishes, prismatique color shift, and happy-go-pukey. It also makes me laugh due to the price. They should just hang it up in the store as modern art. That is an N with some downed DCR! The bridge puts it right where a T should be, but that neck is a little shy of 4 k short of status quo (naturally degaussed via father time?). Probably still sounds nice. I have a degaussed neck pickup on one of my old HIIN DC's, those vintage Hag PAFs I yap on about are all wired at 8.2K, and they almost all come in there, precisely. One of my 2 vintage dubcuts is just shy of 5K on the neck, so it's lost almost half of its DCR. It's a little more delicate, but VERY rich and round, and a wonderful vintage tone. I'm glad it's on the neck rather than the bridge.. great for chording. I'll bet it's got a coil either split/disconnected, or it's shorted out with 4.7k reading. The DCR is in the area for a T, or an SD with some mangled wingdings. By the way, not everyone prices their V220 like a crazy person. Heh, the first seller of that (the one who sold it for a reasonable price, not $1300 guy) is the guy I bought my B.C. Rich from. I noticed it when crawling through his other gear for sale, and was feeling really tempted until I noticed that it was a tremolo instead of a fixed bridge. 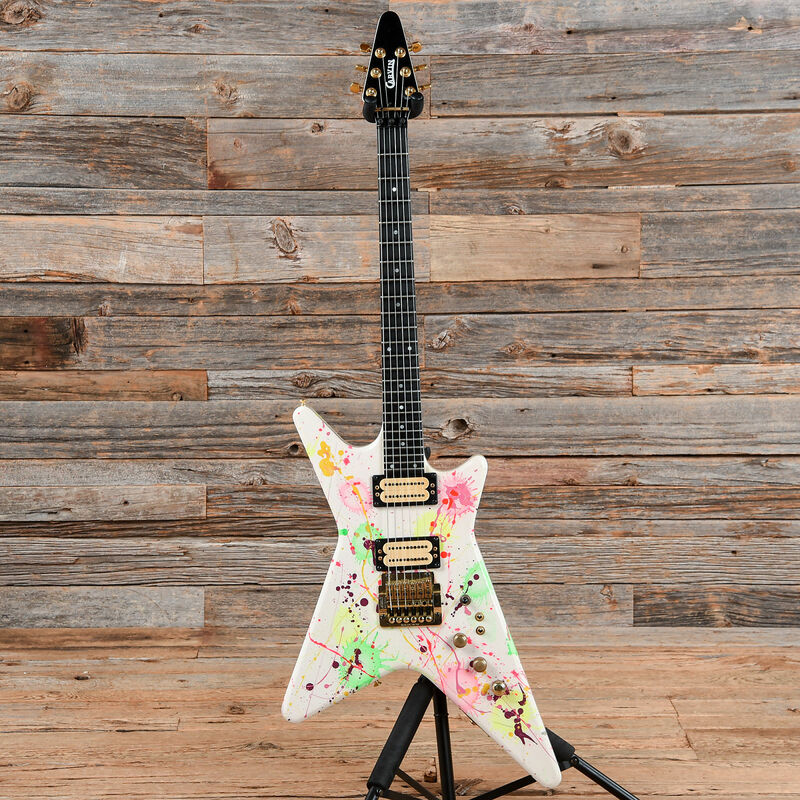 Obviously not the original finish, but I dig the hell out of it. 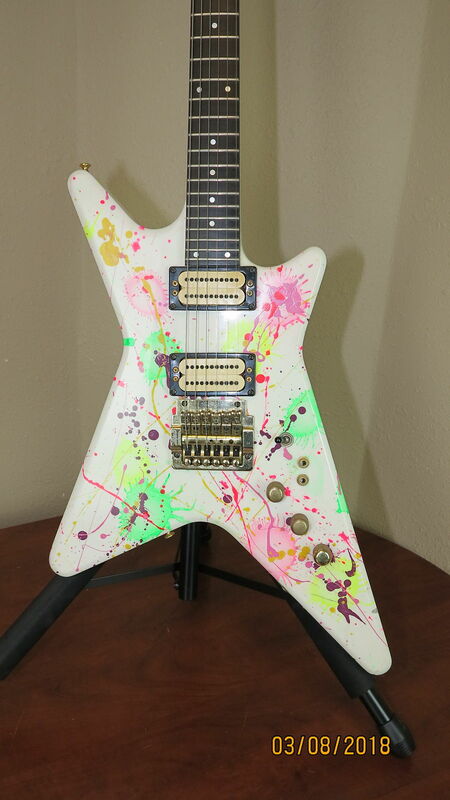 I like bright and attention-grabbing guitars! Cynical wrote: ... was feeling really tempted until I noticed that it was a tremolo instead of a fixed bridge. Yeah, but it's a Kahler - a functional, workhorse trem without the finicky persnicketiness of a Floyd. One of these days I'll try a Kahler and see how it compares. Not that I'm a Floyd hater, but it has its drawbacks; primarily the raising/lowering of the string action with extreme movements. Same with basically any other floating vibrato, except for cam-based and rocking bridge designs. The Ibanez ZR mitigates much of it, but that isn't exactly the most available design, plus has a weakness in the axles, which can break. I'm waiting to see a torsion-bar spring and a combo cam-based fulcrum style that solves the string height change problem. Oh, wait, I have that design on a piece of paper, and never built one. Nevermind. Indeed. I don't know of Cas Madman caught it, but I was saying the same thing.. the new Kahler Hybrid Pro will drop right into the screw holes of the old bridge, without any mods.. and like I've trumpeted a million times you can lock it down into a hardtail with a turn of a grub screw, or have a bitchin dive bombing locker (and choose your saddle material, along with chrome, gold or black for the primary brass bridge) which imho nukes the Floyd for convenience, ease of use and adjustability. The PITA nature of the Floyd (with no offense to its users, this is merely my own short temper with the knife edges, amount of wood hacked out of your guitar, and tuning/stringbreaking/etc agonies) makes it no contest. Especially when using a reinforced string to level the tuning stability playing field between the two bridges. UnexplodedCow wrote: I'm waiting to see a torsion-bar spring and a combo cam-based fulcrum style that solves the string height change problem. Oh, wait, I have that design on a piece of paper, and never built one. Nevermind. I have doodled up a design for a tremolo bridge that locks the strings on the saddles, while the entire bridge assembly "floats" back and forth, rather than up and down. Solves the issue of wood loss without the big, ugly armature of the top-mounted Floyd. Unfortunately, my Dad the machinist retired and passed on before I could get him to machine a template for me. I've had great success getting Parts Badger out of wisconsin precision CNCing parts for me for work, but it's not cheap and what you send them has to be fully fleshed-out design wise, or else it gets REALLY expensive.